So, you’ve decided you’re ready to sell your home. Now is the time to get your home ‘ready’! There are a few easy steps that you can take to ensure that your home is ready and more accommodating to a wider range of potential buyers. The staging of your home is a very important step in selling it. Deep clean your home and rid it of any and all excess clutter. If you are not interested in cleaning or you just don’t have the time, hire a professional to come in and clean for you. A dirty house can be very distracting for potential buyers. Just as important as getting rid of the dirt, is getting rid of the clutter. Remember that you will have people walking through your home and inspecting every nook and cranny. Buyers will want to see in your cabinets and in your closets. No matter how well you think you may be ‘hiding’ your junk, buyers will see it. 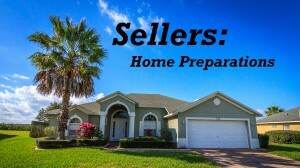 Clutter will certainly be a distraction for buyers, and can even be a deal breaker. Sometimes it’s the little things that make the biggest impression. If there are small repairs or updates that need to made to the home, now is the time to do it. Spending a few extra dollars in the beginning can make a large difference when it comes to the bottom line of what potential buyers see the home is worth. If you see that the kitchen cabinets could use new hardware, or the appliances are outdated, take care of it. Same goes for painting or light fixtures, if walls need refreshed or the light fixtures need updated, spending the money up front to take care of these issues could make a big difference in the end. If you need to, paint your house. Stick to light colors such as whites, beiges or light greys – light colors actually make it appear bigger. Be sure to keep your lawn mowed, bushes trimmed and remove any weeds. Don’t forget about the gutters! The curb appeal is very important, and can either pull potential buyers in or make them pass altogether. Remember, you never get a second chance to make a first impression and neither does you home. For more information on making sure your home is ready for showing, email me at an@orlandovacationrealty.com or give me a call, 1-407-800-0888. I look forward to hearing from you!